Having spent a large portion of my time throughout the early part of the 2018 season in Thailand working closely with the Tourism Authority of Thailand I am incredibly proud to offer the very first of my Thai Adventures, in the picturesque mountain township of Chiang Rai in Thailand’s North. Prathet Thai or ‘Land of the Free’ as Thailand translates, is the perfect description for this seven-day tour with open forest landscapes and small mountain roads weaving in and around the famous Mekong River. With six days of varying terrain taking in the best that Northern Thailand has to offer, this is a tour that will not easily be forgotten. In addition to the cycling aspect of this tour, non-cycling partners are invited to join and will be well catered for as part of the Thai Adventure. Daily activities are listed below and will showcase the very best of the Chiang Rai region from a different perspective than those exploring by bike. Re-united with their cycling partners at day’s end, this is a truly attractive option for those that want to holiday with their partner but share in different interests throughout the day. Group transfer from Chiang Rai International Airport, late afternoon, to Tong Siam House, our Hotel in the heart of Chiang Rai. The transfer will take approximately 30 minutes. Following check-in at the hotel, the local mechanic will assist in the assembly of the bikes. Group guides will then transport guests for their first taste of fresh Thai cuisine. Following coffee made from locally grown beans at the famous family run Bechegu café in Chiang Rai, we will depart for the Doi Tung climb and the King’s private flower garden. The Doi Tung Climb is spectacular and guests will climb through mountain fields that were once home to the worlds capital of opium farming. As we broach the mountain peak, there are fantastic photo opportunities along the mountain ridge that separates Thailand from Myanmar and Laos below. Departing South towards the Doi Luang National Park, Day three has a strong focus on coffee. Visiting various local growers en route for lunch overlooking the valleys below, guests will learn about the rich coffee scene of Chiang Rai and visit Northern Thailand’s largest coffee producer before enjoying a spectacular descent down through the small hillside villages scattered amongst the rich pine plantations. 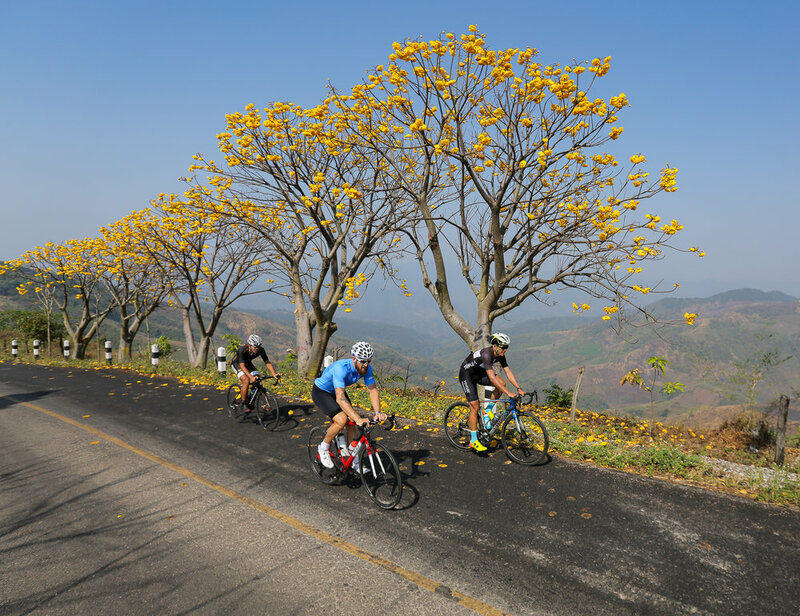 A day rich in Thai cultural and world class cycling terrain, guests will be treated to a serving of local delicacy, mango sticky rice, upon completion of the day’s riding once back in Chiang Rai. Collected by our local transport provider, guests will be whisked away to the mountain side village of Thoeng. Following a serving of the regions famous breakfast noodles and local coffee, the day will commence as we set off North East en route for the Phu Chi Fa National Park. A tough but incredibly beautiful climb, riders will navigate around a small ridge side bowl, overlooking the forest below. What goes up, must come down, and the descent that follows lunch will have guests wanting to re-climb the initial ascent so that they can do it all again. A rollercoaster on two wheels, and a day full of climbing and rolling terrain, guests will be rewarded with fresh coconut ice cream and local delicacy’s before settling in for a hearty Thai dinner. Following three epic days on the bike, the legs will enjoy a sleep in and a day of exploring the city of Chiang Rai. With various high-end bike shops, local markets offering fresh Thai cuisine and hand-crafted souvenirs, it will be a challenge to actually enjoy the rest, with a raft of different activities on offer. For those that wish to sit back, relax and enjoy a massage, there are various traditional Thai massage options that will prepare the legs for the final day of riding. Fresh legged and ready for the final day of riding, Day 6 will see riders embark on an adventure through the Thai forest and along the Kok River. With a mix of both tarmac and very light gravel, riders will get to experience the natural hot springs and meet the local Thai elephants. Like any good ride should, the day will be capped off with coffee, sweets and freshly squeezed, local juice. Time to say farewell, until next time! Group transfer to Chiang Rai airport early morning.